Ok, are you sitting down? I want to tell you something…I’m fat. See, aren’t you glad you were sitting down? (Apologies for the selfie. It should probably come with a viewer’s warning.) I’m not overweight. I’m not pudgy. I’m not big boned. I’m fat. Morbidly Obese. And it’s been really hard on me. Not just physically, but psychologically, and spiritually. I’ve been fat most of my adult life. I started gaining weight my freshman year of college and somehow, once the gut started to grow, it didn’t stop. By the time I was 31, I weighed about 265 lbs. Then, for a variety of reasons, I decided to make some changes. I ate less (more on that later), I exercised, and I started running 5 days a week. By the time I was 40, I weighed 165, and I was seriously buff. Then I got married and came unglued. I stopped going to the gym. I stopped running. I started eating. And the weight came back. All of it, and then some. At one point, I tipped the scales at 305. I kid you not. Through some efforts, I managed to get my weight down to 275, where it’s been for a number of years. The piper called in late August, 2017. It was time to pay the bill. I had a heart attack. While in the hospital, I had two mini strokes. I’m telling you, that was scary. 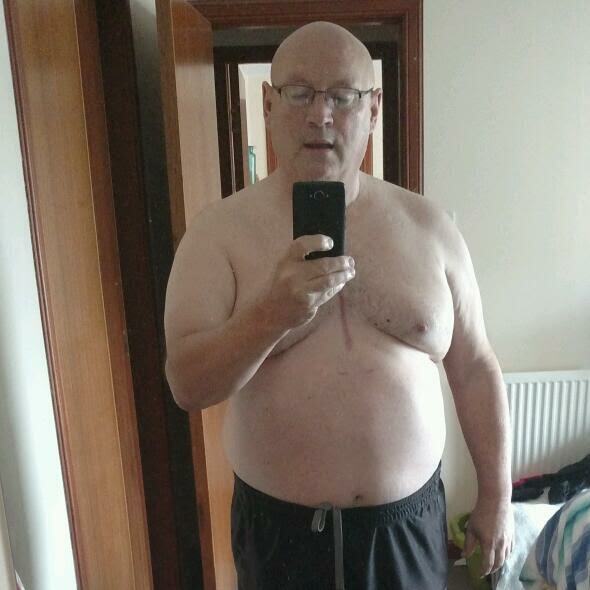 Eventually, as in June 2018, I had triple bypass surgery. While under the anesthetic, I had another stroke. This one has left me partially blind in my left eye. I have blind spots in it and I’m currently receiving treatment for it. Finally, the week before last. I had enough. A photo was taken of me at Church, and when I saw it, I literally cried. I saw a short, fat, old man, I didn’t even recognize. And my heart broke. One of the ways I avoid thinking about my weight is to avoid photographs and mirrors. If I don’t see myself, I don’t think about it. This time, though, I couldn’t avoid it. The photo was in a local newspaper. And I was mortified. I can’t do anything about getting old. I’m 62. It happens. But I am in complete control over my appearance. I secretly wept most of the afternoon. I was depressed for much of the week. It was hard to concentrate on anything. All I kept seeing in my mind was that photo. And all I kept thinking was, you fat, useless, good for nothing. Then, I sat down with my smart phone, did some research, and made some changes. First, let me tell you, and my wife can testify to it; since Y2K, I’ve been on Weight Watchers twice, no three times, The South Beach Diet, The Ketogenic Diet, the Heart Association Soup Diet, and even went on a juice fast after watching, “Fat, Sick, and Nearly Dead”. I lost weight on all of them, and kept it off with none of them. I’m genetically programmed towards being overweight. Both of my father’s parents were seriously overweight. I remember my Grandpa Burton weighing 300 lbs when I was in Jr. High School. And my Grandma was much heavier than that. But it skipped a generation as neither my Dad, nor his brother have weight issues. Dad did, have to diet from time to time, but not always. I’m not sure about my uncle Jerry. My Mom, was skinny as a rail until she was 60. After that, she put on a few pounds, but I don’t know anyone who would call her fat. And neither of my sisters is particularly known as a fatty. Nope, just me. Now, while I am predisposed to easy weight gain, I know I don’t have to be fat, because I lost it, and kept it off for the better part of a decade. But at my advancing age, it’s going to take some thought this time. First, I no longer believe in diet programs. I know they work for some people. But why are there so many different ones? Because each one suits some of the public psychologically. So while I was on one, I might be successful, but the moment I stopped, I gained everything back, plus some. Basically, part of my problem is Spiritual. Let me explain. Many diets tell you that you can’t eat certain foods. You know: carbohydrates, dairy, potatoes, meat, or cheese, to name a few. But, I read in the Bible that none of those things are bad. And potatoes, were the food that saved Ireland. For many years, they were a staple food for people here in Scotland. In Bolivia there are over 400 different varieties of potatoes. People eat them like crazy. Many diets ban honey. Yet, in scripture, Jonathan, the prince of Israel, was revived by eating it after a grueling battle with the Philistines. John the Baptist ate honey as a staple of his diet. I can’t accept that anything God made is bad for you. I just can’t. And frankly, won’t entertain the notion. Having said that, I must recognize that many things we eat today have been grossly altered from the way God made it. Let’s take honey for example, since it’s fresh on my mind. Honey, at least commercial varieties, is often not so much from plant pollen, as it is from bees drinking sugar water that’s put out for them. And then when it’s processed and pasteurized, many of the good bacteria are killed off, so it’s really just flavored, spreadable, processed sugar. And bread. For thousands of years, bread was, “the staff of life”. Wheat, barley, and rye were full of nutrients and oils that made bread a true blessing. Then we learned to process flour and bread lost most of its nutritional value. Then we changed the way wheat was processed, and even more nutritional benefits were lost. Bread today, tastes awesome. But it is no longer the staff of life. It’s become a filler food. Meats, and the animals that provide them, have been altered so much that it should be a crime. Animals are kept in tightly confined spaces and fed a diet of mostly grains until the meat is practically devoid of nutrients. Beef cows, in the states, are often treated with contempt in big feed lots, while we think of cows grazing on wide open spaces, as we enjoy a steak or a hamburger. Pigs are called, ‘the other white meat’. Pigs aren’t supposed to be white meat. It’s the conditions they are raised in, and the diets they’re fed. It’s abysmal. The same thing can be said of chickens, turkeys, and even fish. What we eat today, is far from what people used to eat. Brittan and I know. We spent 10 years as farmers, and I learned more than I could ever share about beneficial ways to raise meat, fruit, and veg. I won’t even talk about dairy in this post. But its the same situation. So here I sat, with my head all full of knowledge and opinions, with some decisions to make. So here’s what I came up with. I’m going to eliminate all, highly processed food products from my diet. That includes bread, margarine, many lunch meats, and the like. And I’ve given myself a daily calorie limit. So far, I’m on day 6. I will weigh myself tomorrow to see how I’ve done. Note: It’s day 7, today. I weighed myself this morning. 268.5. That’s essentially, 1 lb a day I lost this week. Now, I know a lot of that is water weight, and surface or easy junk being eliminated. But see, it’s gone,sianara, see ya, buhbye. And let me say, I have not deprived myself. 4 days I had chocolate. 2 days I had cheesecake. I ate pudding. I had cookies. Oh, I had at least two baked potatoes. I had chicken cordon bleu. I’m eating what I want. With modifications, and with limits. Some foods I’ve pretty much eliminated already. Others, will be cut out one at a time. Fortunately, we have two butchers less that a block from us. They both have local grassfed beef and local pasture raised pork. This is not going to be an easy journey. Nor is it going to be quick. I hope you’ll join me and follow along in my adventures. Ask questions. Give me advice. I’d love to hear from you. You can even share your successes and failures. You may not bash any diet or anyone on a particular diet. Feel free to send photos of yourself. After all we’re in this life together. We might as well get to know each other. Gosh, thanks for listening. God bless you all. Talk to you soon.